Bauerklos had the most liked content! Some proof that Moon / Nuketown isn't 2025. So, Moon and Nuketown are happening at the same time. We've known that for 3 years already but many people have said that they have taken place in 2025 which doesn't really make sense. Take these factors into consideration: - These are the primary events leading up to nuketown: Nuke testing begins / BO1 multiplayer match finishes (1960s) , nuke denotates, CIA or CDC arrives to investigate, outbreak at Area 51 begins. Now, if a nuke JUST went off in the 1960s, and we know that Moon is at the same time, how could these maps be in the future? What sense does that really make, right? "Time displacement" doesn't work with this either because the entire state of Nevada would have to have been displaced, and even then, the rockets didn't hit so why would there be any displacement at all? Another thing, is the Hangar 18 multiplayer map in BO1. In the main SR71 hangar there is a banner that reads "Welcome to GROOM LAKE". Obviously, we know this map is taking place in the 60s era. In No Man's Land, we see the exact same banner, no differences what so ever. Would Area 51 really have the same architecture and layout complete with signs at all around 50 years later? This also explains why TranZit looks so 1960s, the diner, the town, the loading screen music - the world got f*cked up in the 60s so of course it's going to stay like that. Displacement, could then (I guess) be used here to explain all the weird stuff like the bus. Now Die Rise, IDK whats going on there because it seems to be a long time after the 1990s, judging by an advertisement that says "Since 1996 or '97". Maybe when the TranZit crew is teleported they travel in the future in the process? Seriously, are we every gonna figure out what the hell is going on the comic screen or at least who is doing the excavating, or how they managed to build a giant floating spaceship thing to drill 115 from the Sedan Crater? Sure, it could be the U.S. but how exactly do we know WHEN they're doing this? It's in Origins, shown as a concept essentially, so if it's dating back to 1918 then how many times has it been used? I hope that more discoveries can be found as well. Haha I did? But that's certainly one theory I haven't heard of before, but I like it. I think you may be on to something here, I'm intrigued to see if anyone can pose a good argument against this. Yeah, I believe MMX referred to you as pointing that out in his Ultimate Nuketown Loading Screen thread. I hope this gets a good discussion going! Has someone pointed this similarity out already? If you don't see what I'm getting out, note the bubble thingies coming out of both the... guy, and the excavator, they look identical. Also note the craters in the background of the excavation, it suggests that it's happening on the moon... yeah... but we don't know much about the actual location of the Nuketown loading screen comic book. Something else I'd like to note is the hue of the background in both panels, which features a very light blue with distinctive brighter patches around it. 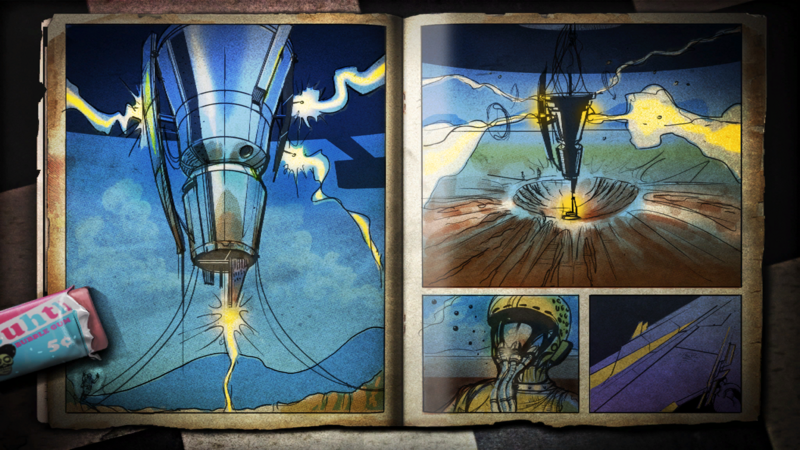 We can really only ASSUME that it is Nuketown since the comic is shown on that map. @Tac did point out that the line shown in the following picture from the Nuketown loading screen comic page could be Nuketown, but I respectfully disagree with ya... (Picture from "The Ultimate Nuketown Loading Screen Analysis", by @MixMasterNut. Check that out if you haven't already. http://www.callofdutyzombies.com/forum/index.php/topic/152716-the-ultimate-nuketown-zombies-loading-screen-analysis/) The message I'm trying to convey is that the Nuketown loading screen happens on the moon itself. The crater suggests that nothing around it has really been affected, but we know that Nuketown had smaller craters around it because of the map select screen in Black Ops 2, which had shown Nuketown after the original nuclear blast(s? ), and that it shortly got hit with a rocket that came in a trio actively destroying the whole Earth in the process. Fun fact: The three Apollo astronauts that traveled to the moon were trained at a Nevada Test Site, another connection with Nevada and the Moon. Perhaps, the 115 Excavation Drill, after being found out by the Americans, was used during the mission to the moon in the 60s to extract more 115? That's just a random little thing I thought about... Let me know what you think, everyone!